The Sunshine State Author Series brings top-notch writers of children’s and young adult literature to Orange County for public readings, writing workshops and visits with students to spark interest in reading. Each featured writer has written a book that has been on the Sunshine State Young Readers Award or Florida Teen Reads lists. Kelly Barnhill writes books. It is a strange job, but, to be fair, she is a strange woman, so perhaps it makes sense. She is a former teacher, former bartender, former waitress, former activist, former park ranger, former secretary, former janitor and former church-guitar-player. The sum of these experiences have prepared her for exactly nothing – save for the telling of stories, which she has been doing quite happily for some time now. The library’s Mira Tanna got a few minutes with her recently to ask her some questions about her Newbery award-winning book The Girl Who Drank the Moon. Mira Tanna: You won a Newbery Medal for The Girl Who Drank the Moon. What is your favorite Newbery Award winner? Kelly Barnhill: I would say that it’s a toss-up between Mrs. Frisby and the Rats of NIMH and A Wrinkle in Time. MT: I have 50 brand new copies of The Girl Who Drank the Moon, ready to hand to members of our Mayor Buddy’s Book Club. They are just gorgeous. What do you say to people who judge books by their covers? KB: We were all told in middle school by stern librarians not to judge a book by its cover, but I have 100 percent bought books because of the cover. I was at Community Bookstore in Brooklyn, and I went to buy a book called We the Drowned by a Danish author Carsten Jensen, and I had to confess to the clerk, “Will you judge me if I’m totally buying this book because its cover?” And he laughs and says everyone does, but it’s also a beautiful book. The cover is what brings us into the relationship with the book and is how the publisher introduces the book to a reader. I have certainly had the experience of reading a book in spite of a cover—I loaned a book to a friend with the cover removed because I knew they’d never read it otherwise. I do think it’s actually important and worth thinking about it. The book is the book, but the cover is what invites us into a relationship with that book. 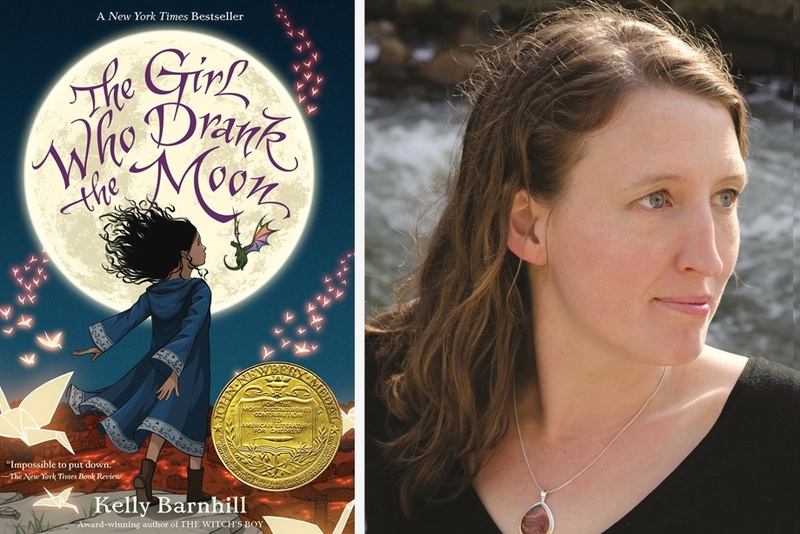 MT: The Girl Who Drank the Moon is on the Sunshine State Young Readers Award list for 6th-8th grade, but it’s a book that appeals across a wide age range. As you travel around reading from your book, who are your readers? KB: All of my books are intentionally broad. Middle graders are very flexible thinkers. What is wondrous is that the world is suddenly making itself available to them and they are so hungry to understand everything. When you write a book for a middle grade reader, you’re writing for several readers, for the reader and for the adult that the kid imagines themselves to be, as well for the parents and teachers and other adults who will read the book. The book has to work on multiple levels and the best books are ones that they will read as kids and read again when they grow up. I’ve read A Wrinkle in Time probably a hundred times in my life. There are interesting harmonics because while it is the same words on the page, they are different books based on the reader’s experience. It is not the writer who builds the story, it is the reader who builds the story, so the books have to have the tools for them to build the story for where they are right now. In my travels with this book I do notice that it isn’t just kids and their parents, it is also adults who are reading for themselves as well as younger kids. I would have thought the scariness at the beginning would be too much for my younger readers. The language is also fairly advanced and but these younger kids are reading up towards this book. MT: This book speaks to the times in which we are living, in which increasingly isolated sectors of our society operate from different sets of “facts” and narratives. Are you surprised at how prescient the book is? KB: I am friends with a lot of writers, and we all shake our heads at the state of things because how could we not see this coming when we all imagine things for a living? I think the problem of false narratives and isolation and using story to manipulate our sense of reality and build walls between people is one of the ugly aspects of human nature that has been with us for a long time. In that way, what I wrote about is nothing new. I do think that we are in a strange time right now. It is the meanness that is troubling. … We want books to reflect the world and cast light, and I hope that it does cast light. MT: You’ve had lots of different jobs—teacher, waitress, activist, park ranger, secretary, janitor. Did you always think of yourself as a writer who did other things to make a living, or did you start writing after trying various other careers? KB: I certainly thought of myself as a writer when I was in college. I wrote a lot of poetry and assumed that I would move headlong into writing after I graduated. My life took a turn. I graduated from college and fell madly in love. We moved down to Florida and then to the Pacific Northwest. We were park rangers and then moved to Portland, and became parents when we were 25 and moved back here to Minnesota. I was following my own life and being very open to possibilities. I was writing short stories, but mostly I liked the idea of being of writer and not actually writing, which is fairly typical of 22 year olds. When my first child was born, I stopped writing altogether. I had nothing to say. We were so broke. We didn’t have a TV and couldn’t go anywhere. We had our baby we were over the moon in love with. We didn’t even have a crib. She slept in the bed with us. Around that time, Harry Potter was first being published in America. We borrowed the first three books from our neighbors and read them aloud well into the night with this baby between us, and I think that is what led me back towards being a writer. They were so fun to read aloud. In the meantime, I became a teacher and my favorite part of my school day was my out loud reading time, and I didn’t realize that all of this was feeding into being a writer. One of the many considerations I have when I’m writing books is how it will sound out loud to a classroom of kids, because I was the teacher who read aloud to my kids. It was not until my third child was born that I started taking myself seriously as writer, waking up at 4 am and writing for two hours until the kids woke up at 6. I didn’t write anything that was good, but it was learning time and it was skill building. That’s really when my focus and understanding of myself as a writer changed. MT: You’ve said that as a teacher you advocated for “free-range reading.” What do you mean by free-range reading? KB: One of the problems when we try to put limits and caveats on how kids read and pick their books is that is disrupts the fundamental nature of what a book or story is for a kid because it is a relationship, it is not an assignment, not a task. The further we push kids away from what this is the more we create impediments for them being able to build those relationships on their own terms. When my son was in third grade, their school had changed its reading curriculum that was 100 percent destroying his love of reading, and I could see it happening in real time and it was really distressing. To see my kid who was picking up Holes by Louis Sachar at home say, “I’m too stupid to read”—that was devastating as a parent, a teacher and writer of children’s books. He didn’t become a reader again until 6th grade. The thing that got both of us through that time was sharing a book out loud, and we continued to read out loud every night. The thing that was a turnaround for him was Rick Riordan. It was that particular moment, and the book spoke to him. The reading logs are deadly no matter what side you’re on, my daughter had points taken off because they had to fill out the stupid logs and she read a novel a day and she said I’m not going to do this. It’s stupid. I don’t have to prove I’m reading because I’m always reading. I started by taking pictures of her reading and giving them to her teacher. I think that part of it has to do with this move towards evidence-based teaching. Everything has to be proven and compartmentalized and packaged. I much prefer education that is reflective of kids and much more interested in process and construction of truth and knowledge and meaning rather than filling in boxes. MT: Fox Animation acquired the movie rights to The Girl Who Drank the Moon. Any news on when a movie could come out? KB: The screenplay is done, and they have a director. I’m going to LA in February so I’ll be meeting with the producer. I met with the screenwriter last July and that was lovely. It was wonderful to talk through the story and learn how that type of storytelling happens. Film is a language I don’t speak. It was interesting to learn about how that happens, and we’ll see whether it turns into anything. MT: We’ll be looking for it. Mira Tanna is the Assistant Manager of Youth Services at the Orange County Library System.